This is a reprint of an article written on the day Ichiro delivered his 3,000 hit at Coors Field, where he did not have as much success as expected in light of it's hitter-friendly history. In the aftermath of the 2000 season, the Seattle Mariners were in need of a pick-me-up. Yes, they were coming off three postseason appearances in six years and had put together a five-year run that produced what were the five best attendance totals in franchise history. However, All-Star shortstop Alex Rodriguez followed free agency to the Rangers, which came on the heels of the trade of Ken Griffey Jr. to the Reds the previous offseason and dealing away Randy Johnson to the Astros in July 1998 in advance of his becoming a free agent. Along came Ichiro Suzuki, the first position player to make the move from the Japanese professional leagues to Major League Baseball, who became a fixture in the Mariners' lineup for 11 1/2 seasons. It was driven by the fact that Ichiro was a favorite of then-majority owner Hiroshi Yamauchi, the head of Nintendo, who made it clear he didn't care what it cost to sign him. And on Sunday, Aug. 7, 2016, Ichiro tripled off Rockies left-hander Chris Rusin to become the 30th player in Major League history to amass 3,000 hits, the first 2,533 of which came during his tenure with Seattle. "There was a mystery about him," Mariners senior vice president of communications Randy Adamack said. "He had been a star in Japan, but now he was coming over here. He had his first name, 'Ichiro,' on the back of his uniform." Ichiro provided a quick answer to all questions, joining Fred Lynn of the 1975 Red Sox as the only players to win the MVP Award and the Rookie of the Year Award in the same season. He also became the first player to win those awards, claim a Gold Glove Award and a Silver Slugger Award, as well as start in an All-Star Game in his inaugural campaign. That first All-Star Game, it should be noted, was one in which Ichiro received more votes from the fans than any other player. Oh, and during that season, he also became the first player to lead a league in batting average (.350) and stolen bases (56) since Jackie Robinson with the Dodgers in 1949. "He became the face of the Mariners' franchise in a very short period of time," said Lou Piniella, the team's manager at the time. The team won the American League West with 116 victories, equaling the single-season record for wins established by the Chicago Cubs in 1906. "It was a special season for the team and Ichiro," said former Mariners president Chuck Armstrong. "It was hard for him, coming from Japan to the big leagues, because it was such a major event in Japan. He handled it. He made the adjustments to Major League Baseball quickly." Ichiro was no small part of that, with Seattle not only building off a strong Asian population base in the Pacific Northwest, but also a huge interest from Japan -- where a deal was worked out for Mariners games to be televised in that country. There were roughly 20-25 newspaper reporters and television crews from Japan. That helped build an international image for Seattle. But contrary to popular perception, it did not provide a major cash influx for the team. Yes, it did sell signage to Japanese firms, particularly behind home plate, which showed up on telecasts back to Japan. But there was no cash windfall for the Japanese television rights. Under MLB rules, any telecasts outside of the United States belong to MLB. So the Mariners received the same share for the Japanese television deal as each of the other Major League teams. They did, however, have the services of one of the game's premier players, who compiled a record 10 consecutive 200-hit seasons his first 10 years with the team -- including 262 hits in 2004, which broke George Sisler's 84-year-old single-season mark (257)"The big upside was he played well," said Adamack. "He had a marquee value. We quickly became known internationally. Financially? His sponsorship presence was [worth] $1 million or $1.5 million. The [international] television rights were not ours. There were ticket sales through travel companies in Japan, and we sold a lot of merchandise -- and the Japanese tourists put more value on items they purchased directly from our stores at Safeco. We had people buying in bulk to take the merchandise back home." And there was the Yamauchi factor. 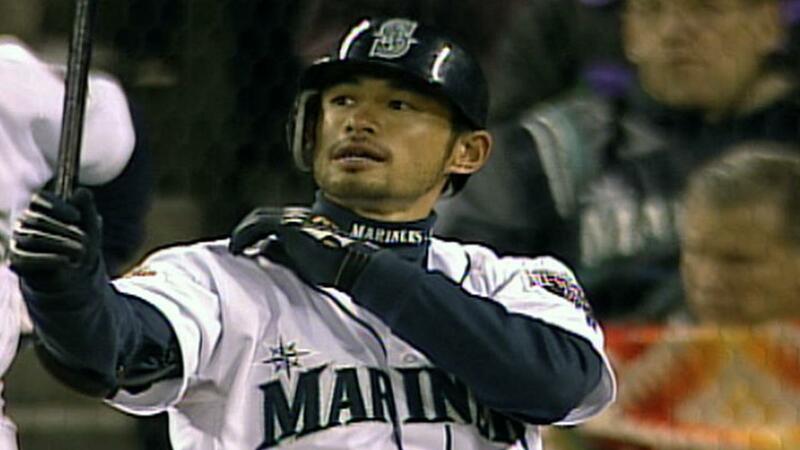 It's not that Ichiro was an unknown to the Mariners' baseball people. Club officials traveled to Japan in 1997 to look at high school players at the urging of Yamauchi. While they were there, they met with Ichiro, who played with Orix. Jim Colborn, who oversaw Seattle's scouting in the Pacific Rim, was the pitching coach. "There was a picture of Junior on the wall, and he told us through an interpreter that he wanted to play in the same outfield as Ken Griffey Jr.," said Armstrong. "Two years later, he was in our Spring Training on an exchange program." And the next year, Ichiro was in camp as a member of the team -- with the Mariners having bid $13.2 million for his posting rights -- $4 million more than the Dodgers, who were the second-highest bidders -- and then signed him to a three-year, $14 million contract. "Mr. Yamauchi told us whatever we have to spend, we needed to spend what it took to get him," said Armstrong. Then came the negotiations with Ichiro, which took a strange turn when Yamauchi made it clear that the Mariners could not give Ichiro more than the four-year, $30.2 million contract they gave reliever Kazuhiro Sasaki a year earlier. Armstrong said agent Tony Attanasio balked, but "Ichiro told our scout, Ted Heid, [who had replaced Colborn], that he would take it. He really wanted to come [to the United States], and it was a Japanese thing -- where the senior member had a special ranking." That turn of events led to a special time in Seattle.